A respected painter, nominated for the PB Portrait Awards on eight occasions, visited Art students at The Sixth Form College, Solihull last week to hand out an award for excellence in painting. 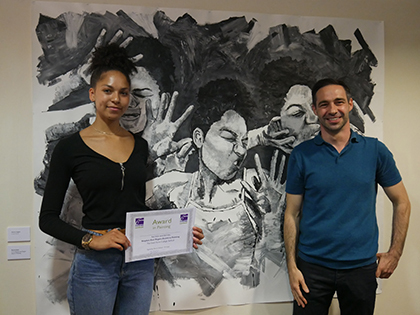 The Stephen Earl-Rogers Award in Painting was given to Year 13 Fine Art student Eleanor Huggins (aged 18, from Kings Heath). She beat off competition from eight other students with her self-portrait, depicting herself trapped behind glass. Stephen Earl-Rogers said choosing a winner to be incredibly difficult and he was impressed with the standard of work across all nine shortlisted painting. However, he declared that Eleanor’s piece was the most “successful and completed piece of artwork” in that it had achieved its stated aim and required no improvements to be exhibited or entered into competition. Stephen spent time talking to all the nominees about their work to discover their motivation, what they were trying to say with their paintings and how they would develop their work further. He was able to offer constructive advice about the individual works of art and what students could do to develop their talent in the future. Stephen Earl-Rogers has exhibited at the BP Portrait Awards on eight occasions. His work has been shown in most major cities throughout the UK and has been sold through Sotheby’s and exhibited at Christie’s and London’s Mall Galleries. He has also exhibited at Art London in Chelsea, the Ikon Gallery in Birmingham in 2011 and Art 2005 at the Islington Design Centre. He was selected for the prestigious Garrick Milne prize exhibition and invited by the National Portrait Gallery to contribute work to an exhibition celebrating its 150th anniversary.